PE·ZZE·TTI (puh-sey-tee) - "little pieces" in Italian. The name may be Italian, but our new Pezzetti designs are unquestionably American. Pezzetti demonstrates our Utah-based design team's passion for transforming ordinary materials into extraordinary works of functional art. In our Pezzetti fixtures, glass is the superstar! Each orb is fabricated by inflating molten glass and working it in a furnace. It is then rolled in large pieces of shattered glass, or frit, and returned to the furnace to smooth the sharp, rough edges. The second pass through the furnace ensures that each "little piece" is securely bonded together to create one distinctive work of art. Each orb incorporates superior quality. 93 CRI LED lighting from CREE® - a market-leading innovator in LED technology. The end result is a luminous product that diffuses light dramatically and suits many current styles. 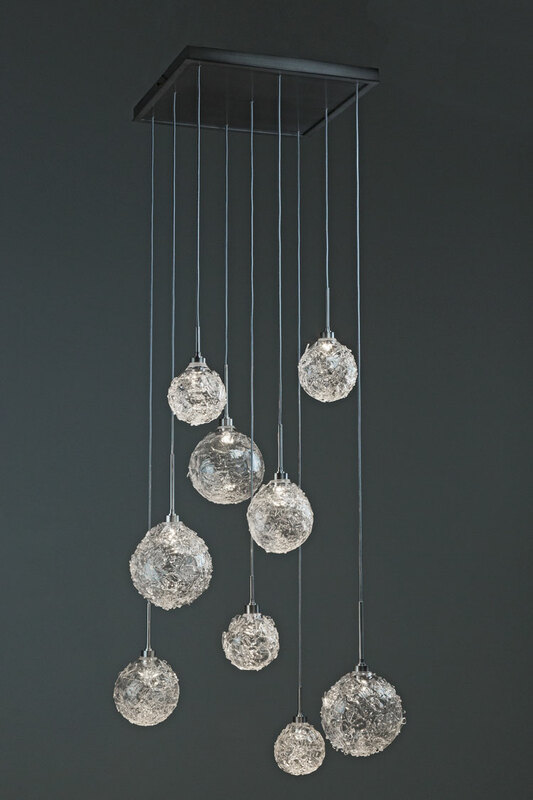 Pezzetti fixtures include 3- and 9- piece multi-port chandeliers, single pendants and sconces. It's available in Clear, Smoke, Bronze and Amber glass colors. If Pezzetti would be the perfect addition to your next project, give your Hammerton representative a call! This is the first post in what will become our monthly "View from the Shop" series, presented by the Hammerton design team. Each month you'll get a glimpse of one or more custom fixtures 'hot off the shop floor' before they ship to their customer. We hope you enjoy this inside look at the work we do at Hammerton, and please tell us what you think! Often, it all starts with just one fixture. In this case, the fixture was an indoor cover sconce -- and from that single concept grew a series of crisply-lined fixtures in the striking combination of custom white glass and black finish shown here. The designer, Carpenter Interiors of Buffalo Gap, Texas, wanted a clean contemporary look that seamlessly united the interior and exterior living spaces of a client's new home. 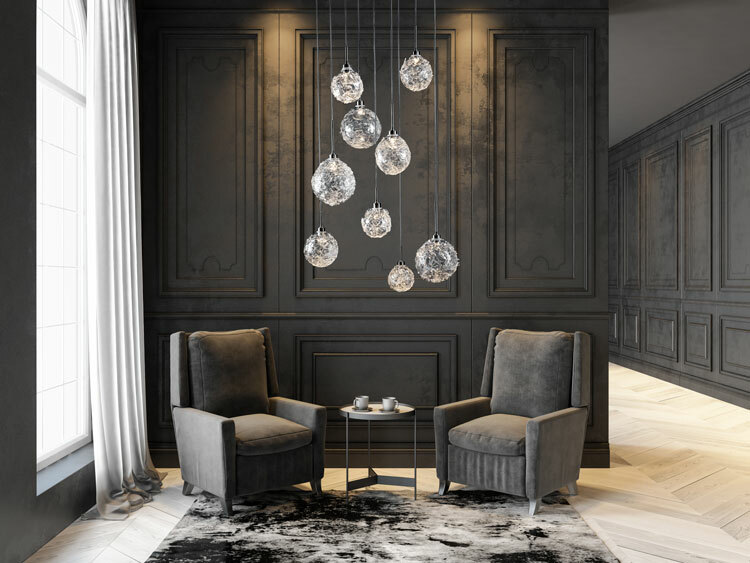 Designed to punctuate the overall aesthetic of the interior living space, this drum chandelier is 26" D by 44" H. It is a CH2254 catalog design from the Hammerton Contemporary collection that has been modified in both size and materials. The catalog version is 60" D. The designer chose a custom glass lens to complement the Matte Black finish shown here. The original inspiration for this project: the ID2176, one of our best selling contemporary cover scones -- likely due to its unusual design and broad versatility. Shown here in custom white glass, a Matte Black finish and the standard fixture size of 22" H x 7" W x 3.5" D.
For the outdoor sconces, we modified the interior ID2176 sconce design to accommodate a UL damp rating for exterior use. The design incorporates the same custom glass, but the Textured Black finish is a super durable, high performance AAMA 2604 architectural finish. For the dining fixture, Carpenter Interiors chose a 7-light version of the Contemporary PL2253 that has been modified to a 73" width. The cylinders are clear seeded glass and the finish is Matte Black. The standard PL2253 is an oversized 131" in width with 11 cylinders, but ike many of our designs it is easily modified to a custom size. For bar pendants, the LA2095 perfectly complemented the larger fixtures in the space, Carpenter Interiors extended the same custom white glass to these fixtures, which measure 4" D x 12" H.
We hope to show you these fixtures again once they are installed. In the meantime, if you'd like more information on any of the designs shown here, please don't hesitate to contact your Hammerton sales representative. Stay tuned for another "View from the Shop" next month, and let us hear your thoughts below! Modello Square Pattern chandelier with a flat bronze finish. Modello Ellipse Pattern Chandelier with a flat bronze finish. 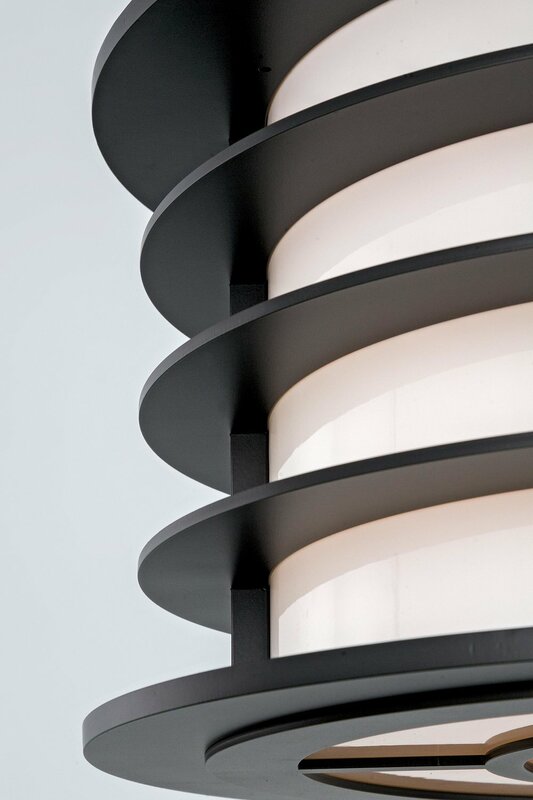 Detail of the Modello Ellipse Pattern chandelier. Inspired by leading fabric design styles, the new Modello drum collection from Hammerton Studio offers a surprisingly sophisticated yet subtly whimsical alternative to the traditional drum that’s perfect for any contemporary or transitional space. Sleek and versatile, our take on the shrouded drum features layers of beautifully finished metal, precision-cut into pleasing asymmetrical designs. Modello Square offers a fresh interpretation of the iconic Roman Key pattern, while Modello Ellipse playfully evokes the orbital paths of celestial bodies. Both are available in two finishes and ship in three weeks or less with site-adjustable rods. Modello drums retail for $1,695 and are available through leading lighting dealers nationally.Click here for a list of authorized retailers or contact your Hammerton factory representativefor more information. A rectangular chandelier with sleek, clean lines lends an unexpected edge to the transitional decor in this Hawaii home. This modern lake house by McClellan Architects features metallic square shaped pendants and a curved chandelier, all by Hammerton. Whether spaced out or clustered together, these rectangular pendants by Hammerton add style and function to this open stairway landing. Hammerton offers a broad palette of beautiful finishes that complement just about any decor, including this modern kitchen. Four delicate pendants and a matching chandelier add a luxurious touch to this contemporary kitchen. Interiors by Staprans Design. A pair of whimsically shaped pendants gives this ultra-modern space a unique flair. This Hammerton chandelier combines organic rustic forms with contemporary shapes for a visually stunning result. Interior Design by Pamela Pennington. This beach style bathroom's light and airy atmosphere is enhanced by a pair of clean, contemporary pendants. Interior design by Pamela Pennington. 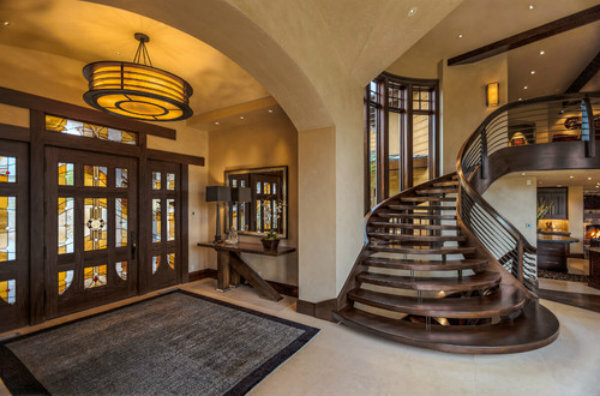 The amber glow from a Hammerton contemporary drum chandelier and wall sconce gives this modern craftsman entryway a welcoming warmth. The metalwork on these elegantly crafted Seriph chandeliers instantly transforms this traditional dining room into a transitional work of art. Hammerton's Lightspann acquisition in 2011 expanded our materials capabilities into all forms of artisan glass — blown, slumped, fused and cast. This stunning material can coordinate with virtually any style! 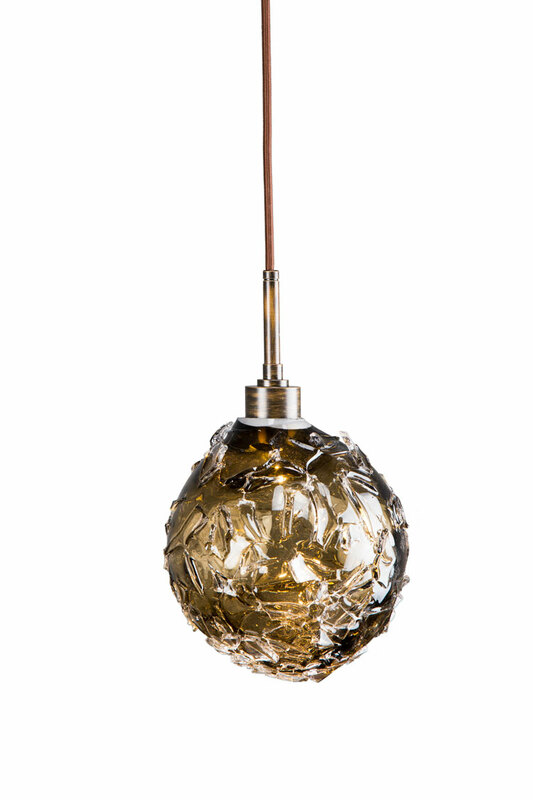 Believe it or not, some design professionals still think Hammerton is exclusively about pine cones and elk heads. While crafting organic mountain rustic lighting for the burgeoning Park City market got us started back in the 1990′s, the truth is that our design breadth has expanded dramatically since then. Today, Hammerton encompasses a wide selection of transitional and contemporary styles. For example, our versatile Contemporary Collection, originally launched in 2005, represents well over half of our business today. As part of our move to incorporate a contemporary aesthetic in the Hammerton product mix, we took an industry-leading position by working with a number of new materials. In fact, we were the first lighting manufacturer to incorporate woven steel mesh and ecoresins into our designs. More recently, our Lightspann acquisition in 2011 expanded our materials capabilities into all forms of artisan glass — blown, slumped, fused, cast — and further broadened our contemporary and transitional offerings. Today, our extensive palette of materials extends well beyond traditional mountain organic materials like steel, rawhide and mica to include textiles, fabrics, parchments, ecoresins, mesh, stone, aluminum, crystal and much more. To many design professionals, we’re best known for our custom capabilities. The majority of the lights we fabricate involve some element of custom design, whether it’s scaling a catalog light to suit a particular space, incorporating customer-specified materials, or creating unique, one-of-a-kind fixtures entirely from scratch. Of course, we still craft beautiful organic lighting with lots of handcrafted pine cones, but if your decor leans in another direction, make sure to give Hammerton a close look. We think you’ll be surprised by what you see.